Announced via Instagram on July 2, Cosmic Radiation Edition Outer Space Men are coming - somewhere, on some day roughly 3 weeks from now, at an undisclosed price. For the paranoid among us, three weeks from the post date would put it squarely during San Diego Comic-Con, thus being something of an issue for those otherwise occupied with travel and feat of fast sell-outs. Hopefully it won't be until after the show, but one can never predict these things. This selection of 8 figures is the same as the first White Star box - Commander Comet, Xodiac, Metamorpho, Alpha 7, Electron+, Astro-Nautilus, Inferno, and Mystron. For those keeping track, there have been three figures which boast glow-in-the-dark features previously. Metamorpho in 2010 was cast in a pale glow plastic with yellow clear accessories. Electron+ was made in the same glow colors but with purple accessories in 2011. In 2014, we got a Gamma-X with painted glow over its frame, but the quality of the glow was pretty rotten. The original Gamma X was never GITD. The 4H used non glow paint. There have been only 2 glow OSM. Metamorpho and Electron. I promise to wait until after SDCC to drop the first of my 2016 bombshells. What you all will see is the most ambitious undertaking the OSM has ever had. Be patient, save your money and fasten your seatbelt. 2016 will be one hell of a ride. I have to respectfully disagree with you here. 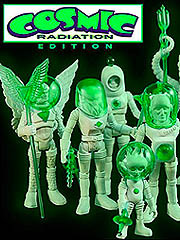 The Infinity Edition Outer Space Men Gamma X figure most certainly does glow - you can see images of it in the review. Shine a flashlight on it in a dark room, and you're going to see it glow.